Blah! So...with a little bit of help and a new gift I was able to get a better picture of this yummy side! We eat green beans about once a week. We plant them in our garden and then can them so we, hopefully, have an abundant supply of them all winter long. 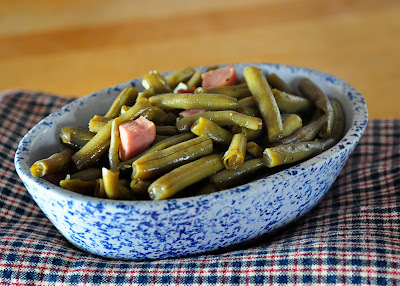 People often tell me that they don't like green beans, but with this sweet twist on them they usually end up loving them! This recipe involves brown sugar which definitely adds a bit of unhealthiness to this fine vegetable, but they are oh so good so it's all worth it ;0)!! 1. 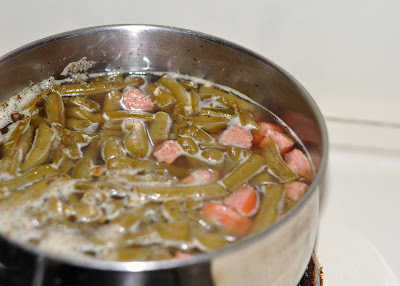 Place green beans in a pan and add just enough water to slightly cover them. Add the sausage, sugar, onion flakes, Italian seasoning, salt and pepper. 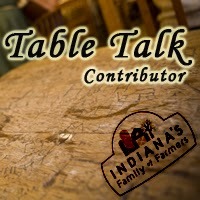 Note:I am participating in Indiana's Family of Farmers Table Talk Series and received a gift in exchange for my participation. All photos and opinions are my own.